Hey, Don’t Double Obama’s Rates! Mr. Obama asked students at the University of North Carolina yesterday afternoon to tell their members of Congress one thing: Don’t double my rates. Once again, Mr. Obama doubled down on flimflam, this time misdirecting towards rising interest rates on student loan debt — instead of targeting the rising cost of interest on the federal debt. According to the White House, interest on the federal debt is projected to surpass $1.0 trillion per annum by the year 2020. 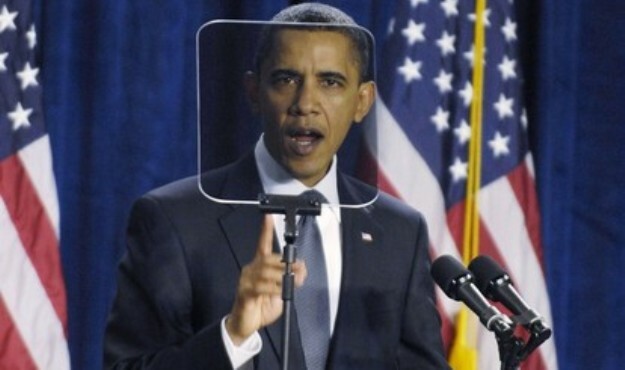 Mr. Obama also failed to mention the $494 billion tax hike scheduled to hit American taxpayers on January 1, 2013. If rising interest rates on student loan debt represents a tax hike, what are we to make of next year’s higher income tax rates? Nine years ago, Congress cut income tax rates across the board. That too was a good thing to do. But on December 31st — that’s a little over eight months from now — those rates expire. And if the U.S. Senate does nothing, income tax rates will rise overnight… Tax policies in seven different categories will expire, including the Bush Tax Cuts, the payroll tax cut, and the AMT Patch. Plus five of the 18 new tax hikes from Obamacare will begin. And just to give you some sense of perspective — Taxmageddon is a $494 billion tax increase, so each year that the U.S. Senate doesn’t act, every man, woman, and child in America will rack up an additional $1,500 in income taxes — an extra fifteen hundred dollars. That’s an extra $6,900 for every U.S. taxpayer (the 50% of us who actually pay income taxes) – an extra six thousand nine hundred dollars. So should my three children, who are all in college, be worried more about rising interest rates on student loans, dismal employment prospects, looming tax hikes, or rising interest on the federal debt? 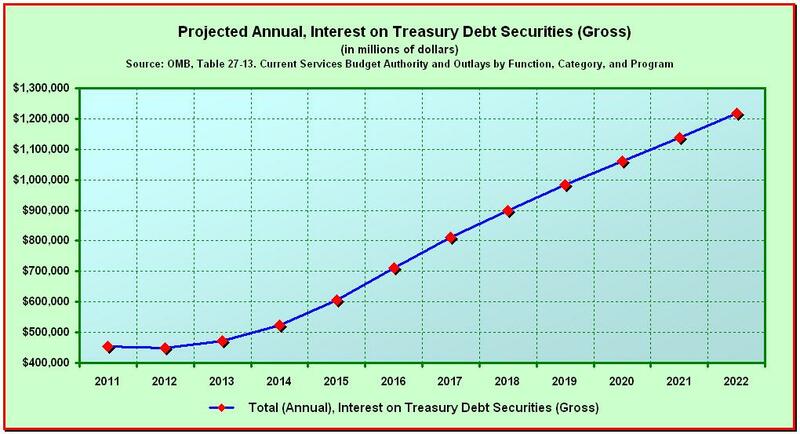 Based on Obama’s fiscal year 2013 budget, per Table 27-13, Baseline Budget Authority and Outlays by Function, Category, and Program, Gross Annual Interest on Treasury Debt Securities is projected to grow from $453.9 billion in 2011 to over $1.0 trillion by 2020, and to surpass $1.2 trillion by the year 2022 (see Chart below). Since this represents about half of the government’s current revenue, that doesn’t leave much room for anything other than Social Security and Medicare. Today’s college students need to give serious and careful thought to a lot more than interest rates on student loan debt. 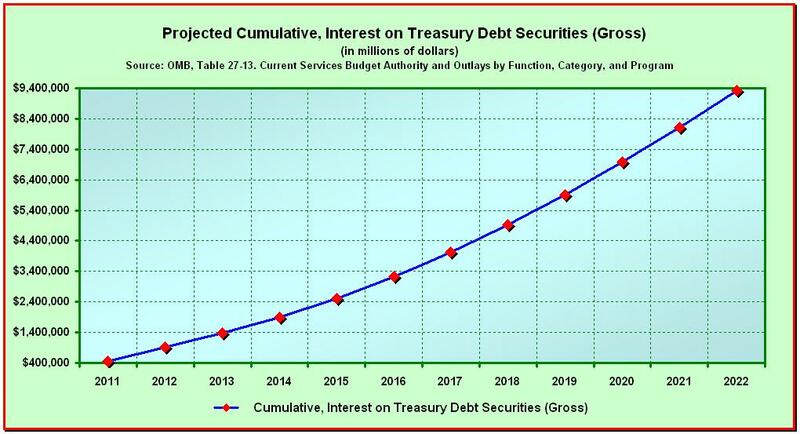 Within the next eleven years, on a cumulative basis, the U.S. Government will incur more than $9.3 trillion in interest on the federal debt (see Chart below). That equates to roughly $30,000 for every man, woman and child in America. And since only 50% of working Americans pay income taxes, for those fortunate enough to obtain gainful employment, it amounts to nearly $131,378 each. And that’s just over the next eleven years — an extra one hundred and thirty one thousand three hundred and seventy eight dollars. Thanks, Mr. Obama, for sugarcoating the dire consequences of your lack of a cohesive economic plan, and for sacrificing my children and grandchildren’s futures in lieu of your own selfish ambitions. Unfortunately, brother, all of this is funny money. Nothing is going to change until Americans are forced into a “Come To Jesus” moment like Europe is facing right now. I am amazed that the main people who were selling us Europe as “a place that America can only one day hope to become” – 2 years ago during the Obamacare debate are now strangely silent on the present predicament of their reference continent. (I am secretly hoping that the far left socialist wins in France. If you thought that the socialists destroyed Spain – after riding in to power right after the terrorist train bombing in Spain in response to the nation's participation in “The War On Terror” – you ain't seen nothing yet. France and German – assuming that the Socialist wins will be the most dramatic bi-polar opposites in the developed world. Germans have accepted their fate and scaled back their debt spending. France is being whipped into a frenzy by a guy who is about to take it out on the rich. Can you ask for a better setup to define the character of state CONFISCATION that “Progressive-Fundamentalism”/social justice is? ?